A number of years ago, the priests of the Diocese gathered on retreat at the Shrine of St. Therese and I led them in the recitation of the rosary. Throughout the course of the retreat we prayed all mysteries of the rosary (the joyful, luminous, sorrowful and glorious). I asked to have these moments recorded so that we could share the opportunity of praying the rosary with others. 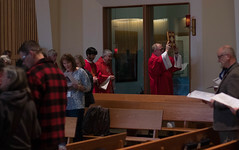 This month’s article is a good opportunity to remind our readers that all are invited to join us in praying the Rosary by going to our website (www.dioceseofjuneau.org). It is my hope that many will join us in these moments of reflecting on the face of Jesus with our Blessed Mother. At the same time, the Blessed Mother was entrusted to us as Jesus hung on the cross when he said to the beloved disciple, “Behold your mother.” She is our spiritual mother and as Jesus’ beloved disciples of today, we should know a close bond with her. I am sure that Mary knew many of the first disciples, and in particular, the apostles. While scripture never tells us this, I am confident that she looked into the eyes of the apostles and that they looked upon her – knowing her to have brought into this world the Word made flesh. 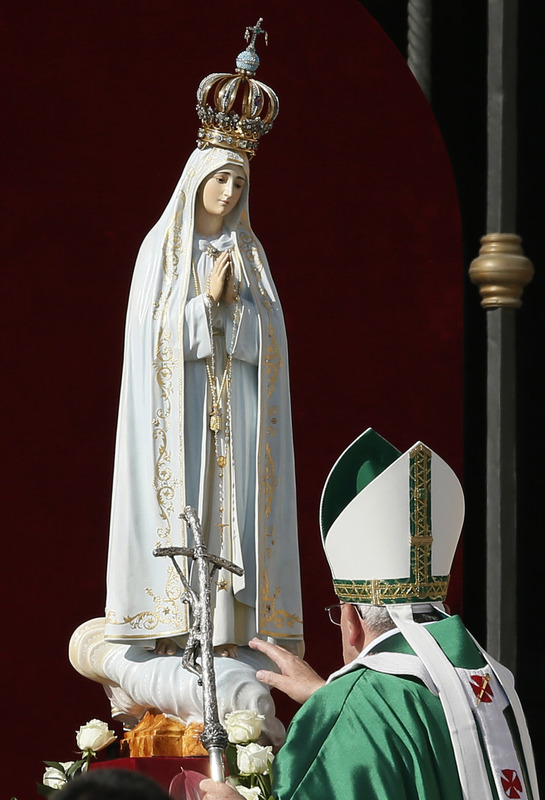 Just recently the Church celebrated the Consecration of the world to the Immaculate Heart of Mary on Sunday, October 13, 2013, an event organized as part of the Year of Faith on the anniversary of the final apparition of the Blessed Virgin Mary at Fatima (October 13, 1917) and initiated by Pope Francis. It was an event organized by the Pontifical Council for Promoting the New Evangelization. To venerate Mary is to be renewed in faith and to see Jesus anew, to allow the light of faith to penetrate our personal doubt and indifference. Mary is the star of the New Evangelization and it only makes sense that we look upon this star that is so full of grace to illumine the way out of darkness. It is an act of entrusting the needs, concerns, and evils of the world to the prayers of the Virgin Mary, because of her unique closeness to Jesus. It is a way of saying to our Mother Mary that we need her help, we need her prayers, we feel our prayers alone are insufficient. It can be seen then as an act of humility, a way of saying to another person whom we trust, will you help me? Mary is here to help us, let us with the beloved disciple John behold her as Mother. What good Mother would ignore the pleading of her children? Lastly, an act of consecration is always aimed at Christ, who is consubstantial with the Father and the Holy Spirit. 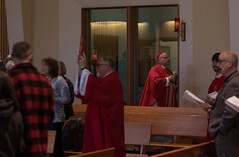 It is an act that leads to reconciliation with the Father because it seeks union by the Holy Spirit with the Heart of Jesus, our peace and reconciliation. It is ultimately bound up in the great commandment to love God and neighbor and makes no sense apart from this aim. The act of consecration is made through Mary because in her person she embodies the path of union with the divine love of God that all must follow. She shows us in a special way how to find Jesus and to bring him deep into the recesses of the world. Throughout this month of October, let us conform to Christ with Mary, pray to Christ with Mary and proclaim Christ with Mary – and strengthen ourselves in the process, every time we pick up the rosary.